He came across the land that would become their home almost by chance. A self-taught photographer (as well as a graphic designer and furniture-maker), he would often escape the city and venture into the surrounding countryside in search of landscapes to photograph. Out in West Lothian one day, he spotted a ‘for sale’ sign. Investigating further, he discovered it referred to seven acres of beautiful mature woodland, streams and wildlife. It immediately won him over. Despite being a self-confessed city-dweller, Jo too fell in love with the place and was ready for change. It took them just two months from seeing the small-holding (which they now refer to as Shangri-La Farm) to packing up and moving to the countryside. “I didn’t realise it at the time, but a TV show I’d been watching about relocating and changing your life in a bid for modern self-sufficiency was really instrumental in what happened next,” remembers Jonathan. The couple had seven acres on which to create something new, and everything from a lavender farm to a tree nursery was considered. 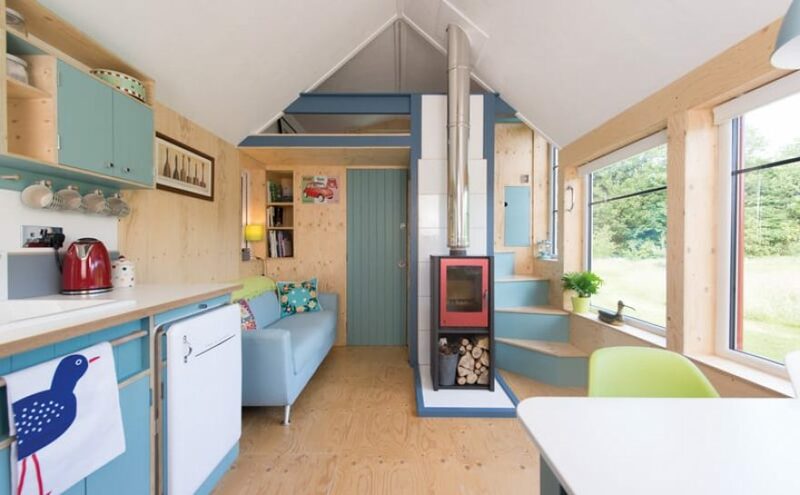 Eventually, Jonathan’s background as a furniture designer and maker, his 20 years’ experience and his passion for the craft guided him towards the idea that became Tiny House Scotland. 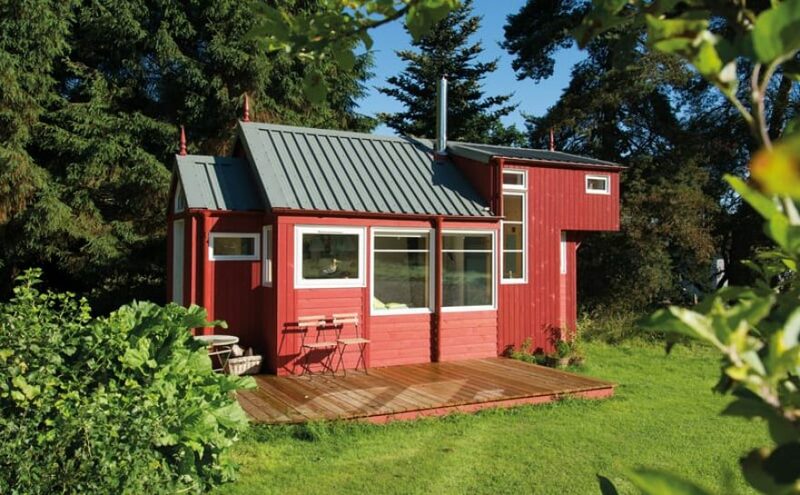 All of this came together when he decided he would try to build a small wooden home to high specifications, similar to Passivhaus standards; it would be constructed on wheels, thus classified as a caravan, within the size limitations of UK householder permitted development regulations; it would be able to operate on or off-grid; and, where possible, it would be made of robust, sustainable, low-maintenance materials. 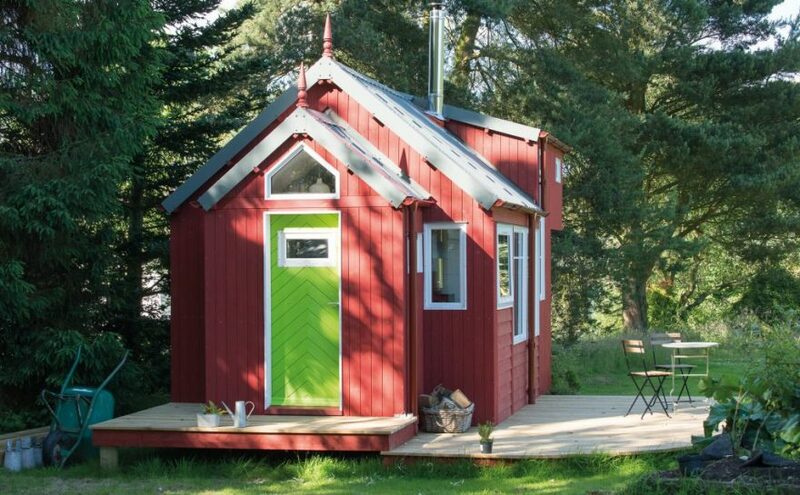 The NestHouse, as he calls it, is 3.4m wide and weighs in at some 6.5 tonnes, so is by no means a caravan. It is built on a wheeled chassis, though, allowing it to be moved on site by a tractor but not to be towed on a British road. With the primary aim being the conservation of space (the house is 25 square metres, or 269 square feet), it feels deceptively roomy. Following the Passivhaus standard, he has maximised energy efficiency. The property uses passive solar orientation, so the positioning of the house demands that the sun’s warmth is harvested on the south elevation through large windows, while the north elevation has minimal glazing to reduce heat loss. There is also a brise-soleil that acts as a sunshade in the warmer weather, preventing overheating inside. As a result, the interior of his home has been a steady 20ºC for the last six months. The structure’s façade is a Finnish spruce ‘Thermo-wood’ – timber that has been heat-treated to modify the resins within it, making it more resistant to water and less susceptible to insect attack and mould. It is then given a further eco-coating. Internally, Jonathan has created lots of hidden storage and built furniture that can be adapted depending on how the space is used. 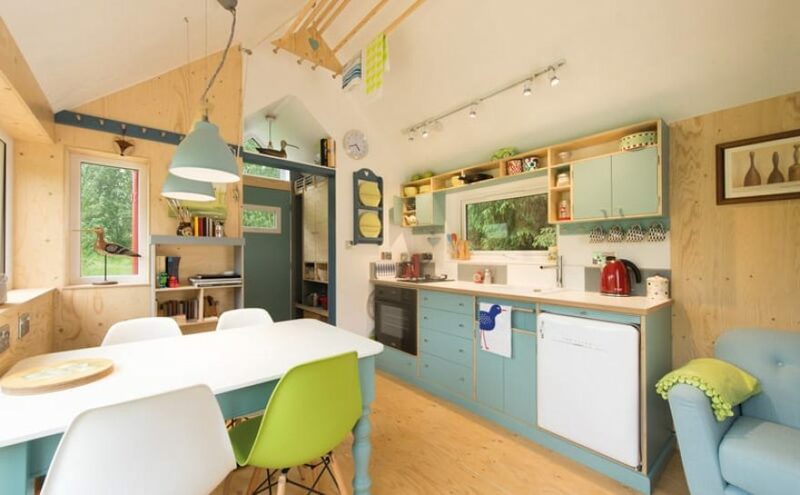 His experience of designing and constructing kitchens and freestanding furniture has been crucial here, and the attention to detail is impressive. He has been able to elevate the interior spec beyond temporary or ‘travel-size’ pieces, while a minimal palette of warm colours and materials and an ability to utilise every inch of the space without making it feeling cramped all contribute to its success. As well as the NestHouse structure, he has also devised a smaller NestPod version (which is towable on roads). Each has a variety of additional features such as porches and sleeping lofts that can be tailored to suit an owner’s needs. 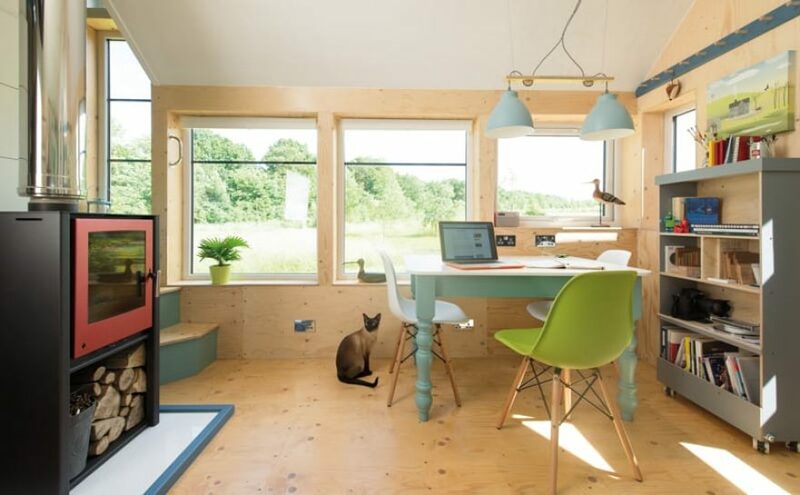 Internally, the structure can be built to a bespoke spec, and it can be delivered as a shell or as a fully plumbed, wired and furnished home. Jonathan believes the NestHouse can solve a variety of problems, suiting downsizers, those who are looking to live mortgage-free, and possibly even social enterprises (there is potentially going to be a Tiny House village in Edinburgh for homeless people). He is also talking to clients who are looking for a structure for their garden to serve as a studio space, granny flat or office. “This is something you could live in for less than £50,000,” he says. “People are starting to think, if we had one of these, we could perhaps live without a mortgage; we wouldn’t have that millstone around our neck – all that debt and having to work for the rest of our lives. That chimes with a lot of people.